As the topic of “Community” is personally very important to me I’ll focus in this blog post on that. A year ago I wrote about how important YOU are to keep a technology alive. Some things have changed since then. But not my opinion! After being now with Salesforce for nearly four months (yup, time flies by) I’ve to say that I’m very happy with their engagement to support and grow the community at large. When I refer in the following to “developers” you can feel free to substitute it with “administrators” or “users”. Based on my role I’m focusing on the developers part, but the other groups are similar organized. So you can easily see the scale. 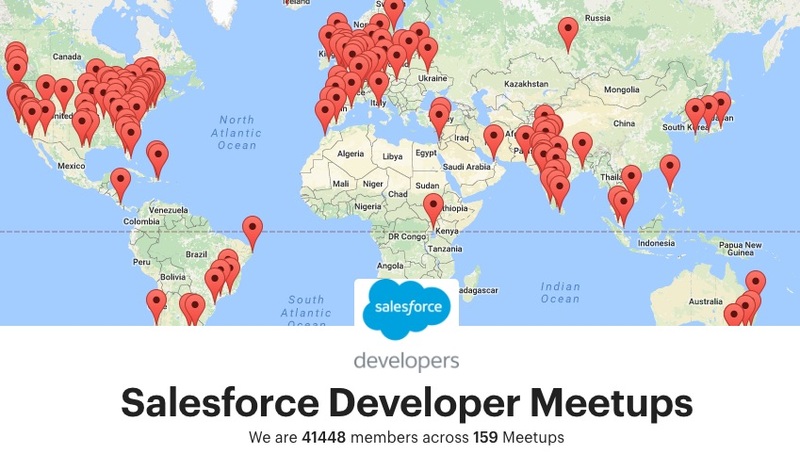 Salesforce helps people to start their own meetups. Meetups are the small(er) version of a full-day user group event and are regular, mostly locally organized events where developers (and people interested in becoming some) get together, share ideas, attend a knowledge share presentation, have some beverages – and lots of fun. To pick up some examples: you can meet on this Monday 90+ developers in London where two of my colleagues will give a talk. Or join the Twin Cities User Group in Minneapolis for a live viewing party of the Dreamforce 2016 keynote. Checkout the full listing of meetups here. If you don’t find one for a location near you – just start one. To be honest: I had not the chance till now to attend one in the Salesforce world. But from my experiences in the awesome IBM Collaboration user group community – I’m in there since 16 years and counting – I’m pretty sure that they are great too. Duration – days (conference) vs. hours (meetup). Sessions – during a meetup you often learn about a specific topic (i. e. by a presentation), on a conference you’ll have to select from a broad range. All those events are community organized – people do it in their spare time. They are mostly free or take a small fee to cover the costs. You can’t get more access to knowledge, mostly by national and international leaders and specialists in the community. If you learn about a User Group conference – attend! I learned so much at those events – and I made lots of (good) friends. The latter is what community is about! 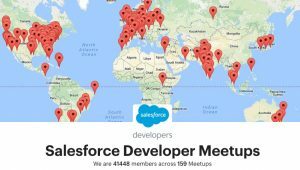 I’ve compiled a list of some Salesforce User Group conferences below. The latter, French Touch Dreamin, will be held on November 17th 2016 in Paris, so you’ve plenty of time to register. You don’t want to miss listening to Erica Kuhl, Vice President for Community at Salesforce, or Peter Coffee, Vice President for Strategic Research at Salesforce. Salesforce runs a community program for the technical people, administrators and developers, that recognizes their outstanding achievements for the community. It’s the Salesforce counterpart to the IBM Champion program where I had the honours to be named as a Champion for the last four years. From my experience named community leaders are accessible, friendly, engaged people that are always there to help out. If you find one – talk to her/him. It doesn’t matter if you’ve got a question, are looking for some advice or just want to say “thank you”. Does it has benefits to become a MVP? Yes, it has. Besides swag (every vendor does that, right?) they’ll have for example their own community on the Success platform where they can collaborate. Or exclusive events, like the yearly MVP summit (organized by Salesforce), where the MVPs interact and discuss in talks and workshops with Salesforce product management and executives (i. e. company co-founder Parker Harris as seen on Jean Michel’s blog). And sometimes a surprise like a greeting of the Chicago Cubs. You can learn from Erika about the program here. As you can see there are lots of ways to get engaged, to get started, to meet new people and to learn. Enjoy!